This Whirlpool top loader offers a deep cleaning and can be found for less than $500 online. It’s Energy Star rated, so it uses less water and energy. Note also that it requires HE detergent to run properly. With 3.4 cu. ft. capacity, it has adequate room for average size loads. 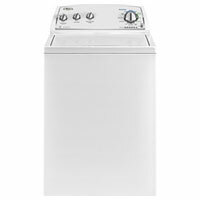 The spin cycle, at a 700 RPM speed, leaves laundry dry, and it’s quieter than other models in this price range. For the decent performance it provides, this Whirlpool model has an unbeatable price.